Had Boris Pasternak never written his great novel, and had it never been made into an Oscar-winning film, would I even be living in Russia? When people ask me how I became interested in Russia, I like to say it was because my mother named me after the main character in Doctor Zhivago – and had she known how my life was going to turn out, she would have called me something else. This year is the 125th anniversary of of Boris Pasternak's birth and also the 50th anniversary of the movie "Doctor Zhivago," produced by the Metro-Goldwyn-Mayer studio and directed by David Lean. The film became the second biggest box-office hit in 1965 after "Gone with the Wind," and won five Golden Globe awards and five Oscars. It has been ranked by the American Film Institute as the 39th greatest American film of all the time. I was always slightly conflicted about the name. As a kid, it was because no one could pronounce it right. “Lara” was the 376th most popular name for girls the year I was born. However, “Laura” was 19th. In fact, in my high school graduating class of 76 students, there were five girls named “Laura.” I learned fairly early on to answer to “Laura” or “Lora” or “Lehra” or anything vaguely in that range. Later, as a college student, I read the novel and found really little to identify with in the character whose name I shared. I was far more like Zhivago’s wife, the ever-dutiful Tonya, than Lara. But I never asked my mother what had compelled her to give me this name until recently. 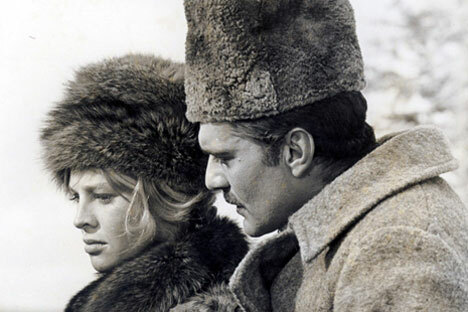 Doctor Zhivago, Boris Pasternak’s classic novel of the Russian Revolution, was published in English in 1958, but it was the 1965 film by David Lean that made the story so popular in the U.S. And it was the film that made such an impression on my mom. In fact, I only learned recently that she has never actually read the book. She fell in love with Julie Christie. “[The film] made Russia seem really foreign and exotic,” she told me. My mother is a musician, and maybe it was the film score by Maurice Jarre that she fell in love with even more than Julie Christie. She told me she played the main theme from the movie, “Lara’s Theme (Somewhere, my love),” obsessively on the piano, and growing up I always felt that I was named more for the music than the character. Finally, I put the question to her, saying that it was a little uncomfortable being named after a character who had rather, um, loose morals, and that I was really far more of a Tonya. So how did I end up being Lara? I can’t say that I’ve ever wanted that, and yet, I haven’t exactly lived an ordinary life. The view from my window isn’t one of onion domes, but it does have plenty of snow, and for this ordinary girl from the American South, maybe that’s exotic enough.